The Spring 2015 series was a success. Resuming in December 2015, join us for the weekly "Paint n Drink" classes! "Take home your own slice of paradise!" 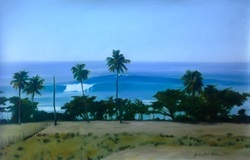 Join us for the weekly Sunset paint-by-numbers "PAINT n DRINK" class at The Beach House in Rincon, PR. Located on Rte 413 above Maria's Beach, a local guest artist will lead you through a sunset landscape painting. Live music, drink specials and Taco Tuesday. $20 advance, $25 at door. Limited space. Reserve your spot now! All levels welcome. Materials provided. Teacher's art will be for sale, so bring your wallet! Would you like to be a Guest Teacher? Click here for more info! Spring 2015 was a success. We will resume in December 2015, please join us then!